If you will be in Central Luzon this Sunday, may I invite you to watch the pilot episode of Travel Blog, the newest show on CLTV 36. Yup, I'm hosting this travel show together with Ching Panglinan. 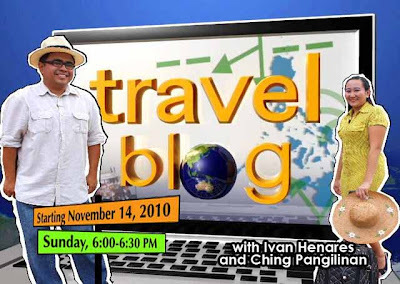 And the first episode will air on Sunday, November 14, 2010 from 6 to 6:30 p.m. To those outside Central Luzon or out of the country, hopefully we will be able to upload the episode within a week or two.